Previous Winter is definitely here! Very interesting. Beautiful holiday… Happy Chanukah to you and yours.. Thanks Rebekah. Happy holidays to you, too. Thanks Theresa. Happy holidays to you, too. A wonderful celebration. Happy Chanukah to you! 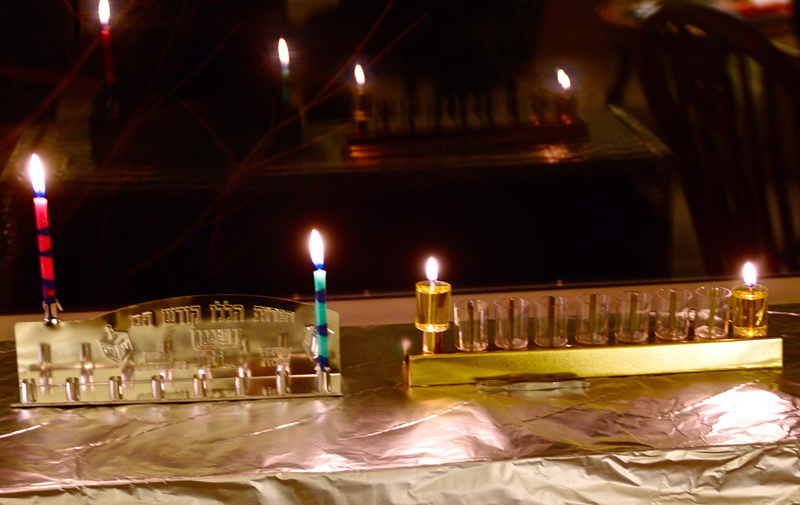 Thank you, Cecelia, for your account of celebrating the start of Chanukah with your friends. Why is the holiday sometimes spelled starting with a C and sometimes with an H? Hi Barbara. The spelling difference is a matter of preference. I use the “Ch” because the pronunciation is not like “H,” but has a more gutteral sound from the back of the mouth. But since that sound is not in the English vocabulary, we find other ways to suggest that sound. Having said that however, “ch” is not representative of the correct pronunciation either. Therefore, the english spelling is left up to whatever people prefer. To spell the word correctly, one must write it in Hebrew. I do not have Hebrew fonts, and if I did, most of the world would not be able to read it. Hope I haven’t confused you more. I have never celebrated Hanukkah, but I would love to experience it and know more about it. Lovely post–and educational for those of us Christians who have been too busy celebrating Christmas to really understand what our Jewish brothers and sisters are celebrating at the same time. Happy Hanukkah, my friend! Thanks Kathy. I appreciate your kind sentiments. Happy holidays to you, too. Thanks Nancy. I’ll try not to disappoint. Have a great day! Happy Chanukah to you and yours Cecelia! Thank you, Sweet Days. I wish you a happy holiday season as well. Another new festival that i learnt about! Wishing you and your entire family happy Chanukkah! Would love to learn more as days pass by! Thanks for stopping by Kamakshi. I hope to post about some aspect of Chanukah each of the eight days. Chanukah is a wonderful holiday, and I’m glad to share it with all who read my blog. You have shared so much about your country and religion, and likewise, I hope this will help people to understand us Jews a little better. Take care and have a glorious day! thank you very much for sharing a bit about all these tradition(s), Ms. F.! And a very happy holiday to you and your family as well! Thank you for sharing! I never knew the meaning of the menorah… I will most certainly be checking here over the next several days! I remember in Greek Orthodox Sunday school they taught us about Chanukah every year (Greek Orthodoxy relies more on The Old Testament than a lot of other Christian sects). Thanks for the reminder! It never occurred to me that Christians learned about Chanukah. I learn something new every day! We learned all kind of things in Sunday school. The first five books of The Old Testament, which we call The Pentateuch, are ascribed to Moses and you might know them as The Torah. The G.O. Church is very much traditional in its teachings (they told us that Christ was a Rabbi, in those words) and, in essence, Christianity is an offshoot of Judaism. My wife was a Seventh Day Adventist and in that branch of Christianity they don’t celebrate Christmas, they go to church on Fridays, and follow a diet without pork or shellfish (but eating meat and dairy at the same meal is OK, so they don’t need two sets of dishes). She’s been corrupted by my influence now and for the eight or so years after our marriage in Montreal, we “compromised” (more of a choice of convenience and not a true compromise in terms of theology) and attended Evangelical Christian churches. Wow! I’m impressed. For real. I always tell folks that Jesus was one of our boys sent to set things straight in the Gentile world! (I may get in trouble for that, but, oh well . . . I’ve been in hot water plenty of times before and I’m still here to talk about it.) And many Seventh Day Adventist are descended from the Jews who were expelled from Spain beginning in 1492, many of whom became Adventist so they could “disguise” their continued observances of Jewish laws and traditions. Thanks for sharing your experience and knowledge. Very interesting. I enjoy learning about you and your family. Have a blessed holiday season, and a kind new year.